Contact: A.L. Baker, Marine, Estuarine and Freshwater, Dept. of Biological Sciences, University of New Hampshire regarding PhycoKey. All aquatic vascular plants have evolved from terrestrial vascular plants, carrying with them many morphological features that originally evolved as adaptations to terrestrial life - vascular tissue in 'true' roots, stems, and leaves, stomates, and waxy cuticle to minimize water loss to the atmosphere. The return to aquatic habitats required further evolution, in some cases loss of terrestrial characteristics. Stomates are reduced or absent from submerged foliage, dysfunctional in water due to low diffusion rates (but important in air). Rooted aquatic vascular plants need mechanisms of supplying oxygen to their roots. Submerged foliage plants, especially those with dysfunctional or missing roots, have changed their leaf morphology to maximize the surface area to volume ratio, both by eliminating most inner layers of cells (mesoderm), becoming highly dissected, and either developing large intercellular space or becoming little more than vascular and epidermal tissue, with few or no stomates, and without any waxy cutin covering. Many aquatic macrophytes also lack supportive fiber cells, depending instead on floatation mechanisms or density regulation close to that of water. The most extreme case of reductionist evolution is Wolffia and Wolffiella, members of the duckweed family, the smallest known angiosperm. also the fastest growing with the shortest life cycle. With a thallus (body) length of less than 1 mm,Wolffia floats on the water surface (epineuston), has more than 50 stomates on its upper surface, and produces a complete flower (one carpel, one stamen). Prior to critical organization of photosynthetic organisms the several classes of algae were considered especially by botanists to be plants. In the three-domain system (Eubacteria, Archaea, Eucaryota) (Woese at al. 1990), based on the six-kingdom classification of all organisms (Eubacteria, Archaea, Protists, Plants, Fungi and Animals) we now recognize that photosynthetic procaryotes are not 'plants', nor are the several classes of algae which are protists. However in popular understanding and even in some academic classes these distinctions are not made, and the uncritical definition of 'plants' (Viridae Plantae) -- unfortunately -- continues. Aquatic macrophytes when rooted are limited to the littoral zone (margin) of freshwater bogs, fens, marshes, and lakes of all sizes, from water surface to depths supporting growth. Non-rooted species can also grow in the open water pelagic (planktonic) zone, either submerged (e.g. Utricularia) or as epineuston (microzone on the lake surface with the unique surface tension. Various species are limited in their depth tolerance by physical factors including light intensity, hydrostatic pressure, and type of substrate. Rooted species have adaptations to low levels of dissolved oxygen in the substrate such as various oxygen pumps. Where foliage is mainly or entirely submerged, essentially all nutrient uptake and gas exchange is by diffusion across leaf and stem (rather than root) epidermal cells lacking the waxy cuticle of their terrestrial predecessors. Diffusion is also enhanced by diminished or no leaf mesophyll as well as, in many species, an extreme degree of leaf dissection -- both factors producing a large ratio of surface area to volume, an adaptation to the slow diffusion rate in water. Because the water column provides a large proportion or all of the mineral nutrients to submerged plants, the roots where present may function solely as anchors. In some species roots are no longer produced, and as a result the rootless plants either drift with water currents or become entangled in other aquatic vegetation. Stomates afford little advantage underwater, so are reduced in number or entirely absent from submerged foliage. Neustonic floating leaves, and the thalli of secondarily non-vascular Wolffia, develop stomates only on the epidermis exposed to the atmosphere. Cook, C.D.K. 1974. Water Plants of the World. W. Junk,b.v., Publishers, The Hague (561pp.). Fassett, N.C. 1957. A Manual of Aquatic Plants (revised edition). University of Wisconsin Press (405 pp.). Sculthorpe, C.D. 1967. 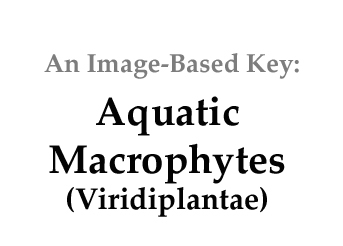 The Biology of Aquatic Vascular Plants. Edward Arnold Press, London (610 pp). Woese C, O. Kandler, and M. Wheelis 1990. Towards a natural system of organisms: proposal for the domains Archaea, Bacteria, and Eucarya. Proc Natl Acad Sci USA 87: 4576–9.